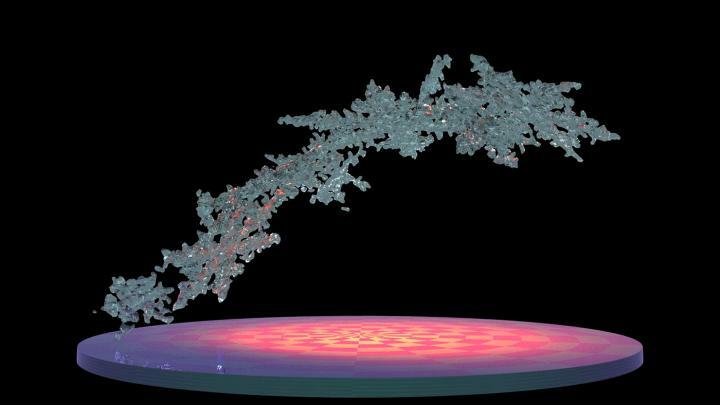 NASA has produced the first three-dimensional numerical model of melting snowflakes in the atmosphere. Developed by scientist Jussi Leinonen of NASA's Jet Propulsion Laboratory in Pasadena, California, the model provides a better understanding of how snow melts can help scientists recognize the signature in radar signals of heavier, wetter snow — the kind that breaks power lines and tree limbs — and could be a step toward improving predictions of this hazard. Leinonen said he got interested in modeling melting snow because of the way it affects observations with remote sensing instruments. A radar "profile" of the atmosphere from top to bottom shows a very bright, prominent layer at the altitude where falling snow and hail melt — much brighter than atmospheric layers above and below it. "The reasons for this layer are still not particularly clear, and there has been a bit of debate in the community," Leinonen said.Simpler models can reproduce the bright melt layer, but a more detailed model like this one can help scientists to understand it better, particularly how the layer is related to both the type of melting snow and the radar wavelengths used to observe it. A paper on the numerical model, titled "Snowflake melting simulation using smoothed particle hydrodynamics," recently appeared in the Journal of Geophysical Research – Atmospheres. Some of the most remote places on Earth are showing signs of change, with potentially global impacts. In 2018, NASA is scheduled to launch two new satellite missions and conduct an array of field research that will enhance our view of Earth's ice sheets, glaciers, sea ice, snow cover and permafrost. Collectively, these frozen regions are known as the cryosphere. Over the course of the year NASA will share an inside look at what the agency is doing to better understand this critical component of our home planet.